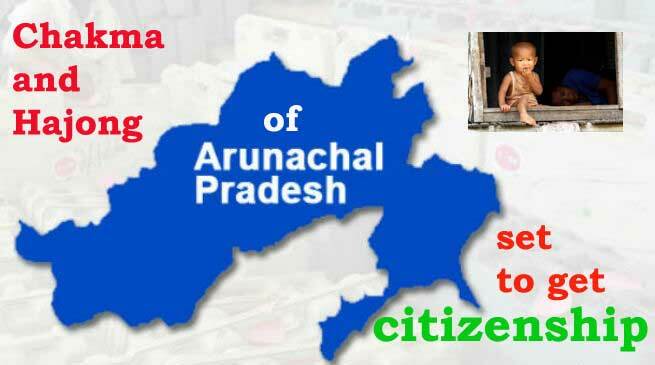 According to media report the centre is all set to grant citizenship to Chakma and Hajong refugees, who have been settled in Arunachal Pradesh for over 50 years. Consultations between the centre and state government on the issue is on. However the state government has argued that if citizenship is granted to the refugees, it would reduce the indigenous tribal communities to a minority and deprive them of opportunities. Since 1990, the All Arunachal Pradesh Students’ Union (AAPSU) has been demanding their ouster from the state. In this circumstances the centre may propose that Chakmas and Hajongs be issued Inner Line Permits, allowing them to travel and work but not possess land rights. It may be mention here that the Chakmas and Hajongs were originally residents of the Chittagong Hill Tracts of erstwhile East Pakistan, who had to flee when their land was submerged by the Kaptai dam project in the 1960s. The Chakmas, who are Buddhist, and Hajongs, who are Hindus, also faced religious persecution in East Pakistan (now Bangladesh). Chakmas and Hajongs entered India through the then Lushai Hills district of Assam (now Mizoram). While some stayed back with the Chakmas already in the district, the Indian government moved a majority of them to the North East Frontier Agency (NEFA), which is now Arunachal Pradesh. According to officials, the number of these refugees has increased from about 5,000 in 1964-69 to 1,00,000. At present, they do not posses citizenship and land rights, but are provided basic amenities by the state government. In 2015, the Centre was given a deadline by the Supreme Court to confer citizenship to these refugees within three months. The Arunachal government approached the apex court in appeal against the order but in vain. It was then that consultations started in earnest between the state and the Centre on the issue.